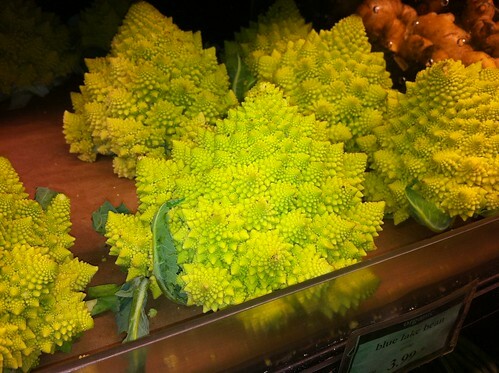 On Monday I was acquiring sustenance at Rainbow Grocery when I came across an edible fractal in the produce section. Yes, a fractal you can eat! But then it gets stranger. The following day my family was in town for a visit to Golden Gate Park. For lunch we headed to Park Chow. My order came with a side of — guess what? — romanesco broccoli! I was surprised to say the least. As for the taste, it’s got a broccoli flavor with a denser texture, a bit like cauliflower. Fast forward to the following morning, when I was reading BoingBoing. And guess what? They illustrated their post about vegetarian diets with nothing other than a photo of romanesco broccoli. What would Carl Jung say about all this? I wasn’t alone in my ignorance, a dozen or so friends and family I quizzed had never heard of romanesco broccoli before. Could it be the ghost of the recently deceased Benoit Mandelbrot is contacting us from beyond the grave with edible fractals?